I am soooo happy to finally be writing this post. My coat is complete! I decided to follow Laura's example and skip the shoulder pads that were causing me such grief. It looks and feels fine without them. I used the lining for the front part of the pocket. The back of the pocket is cut on with the upper side front pattern piece. 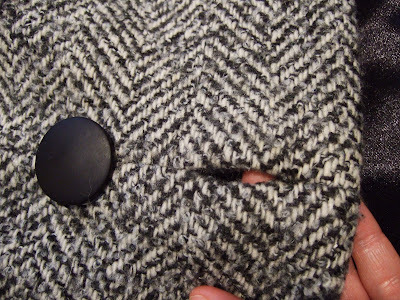 The third row of buttons has an in-seam buttonhole. I considered removing the seam and making a bound buttonhole like the others, but as others mentioned, it is a really neat feature so I kept it. 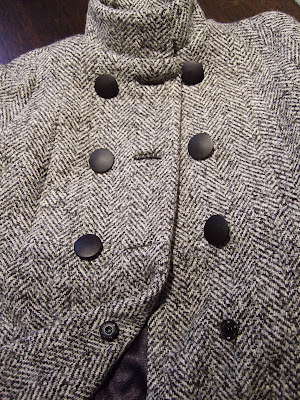 I added a hidden snap below the bottom button (near the waistline) to help keep the coat closed. 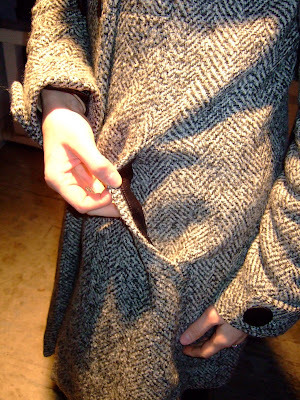 When wearing, the coat openings below the buttons have a tendency to drift open. 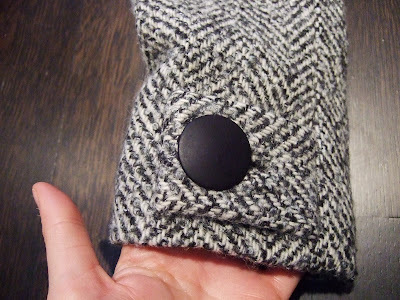 Each of the sleeves has a buttoned tab. 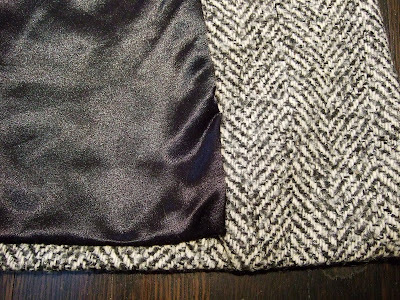 I hemmed the coat and the lining by hand. I added a grosgrain ribbon at the back of the neck so I can hang the coat from a hook. OMG That is SOOOO cute!!! Great job. I don't know if I am ready (skilled) for a coat of that magnitude! It is beautiful and you did a wonderful job on it! Don't you just love it when something you made comes out that freakin' awesome! Fantastic! This has just convinced me to make this coat. It's next on my list! Great coat! I love it. Ooooooooh!!!! Wow Christina. That coat is fantastic. The details you put in make it so special. I'm so jealous!!! Congratulations. I almost cried when I clicked on your link and saw it. It's like giving birth to finish such a project!! It is really a work of expertise. thank you for all your tutorials. Wow! it turned out beautiful!! Thanks for sharing your experience. 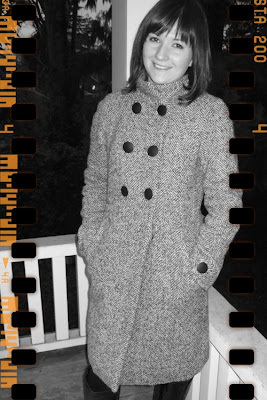 Great coat, it turned out so cute. Very pretty and so professionally sewn. Looks great! So very awesome! It looks great on you and I think you found the perfect solution to meld the 6-button fashion with the 8-button practicality. 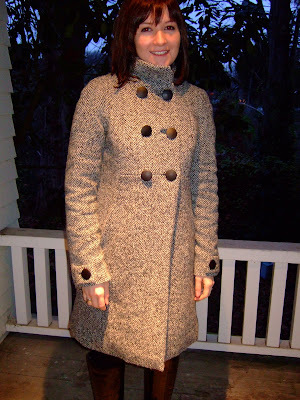 The coat is gorgeous, Christina, and it looks great on you! What a great coat! I love all your detail work. Wear it in good health! 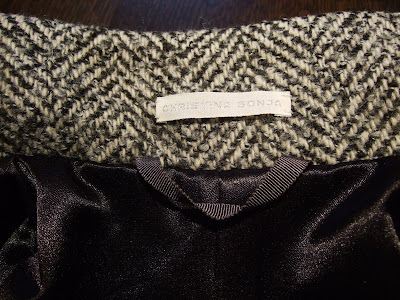 Christina, you did a fabulous job on this coat. I LOVE IT!!! The fabric, the details, everything!! Your coat is fabulous! The details, work-womanship, fabric...you married everything together nicely. Absolutely incredible coat Christina!! I too have shyed away from coats in BWOF because of my in experience, but I keep trying to convience myself that the only way to get experience is to jump in and give it a try. What is the worst that can happen, I have to throw it in the trash??? And I doubt that will happen. 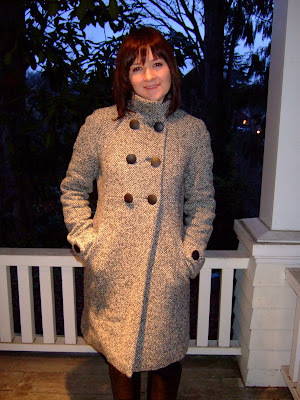 Enjoy your new coat, it looks so wonderfully warm and cozy for our wet & cold winters in the NW. Stunning!!! You've turned a page on your sewing life now! I know this will be the first of many coats to follow! 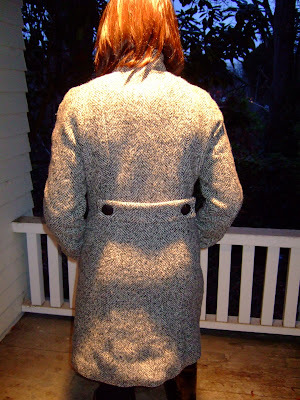 (can you tell coats are my favorite garments to make?) Congratulations!!! Your coat is fabulous! You will love wearing it. Wonderful coat Christina, I'll mark that one. Enjoy wearing it. You look fantastic! I love it! Your coat looks beautiful! I'm bookmarking this for inspiration! Late to the party, yes I know.. but you did a FABULOUS JOB! Congratulations on finishing your first coat it looks great. I’ll bet many more will follow in the future of your sewing life. The coat is Awesome!! GO you! Wow! You go girl! This coat is amazing and the details so neat. Huge BRAVO! You must be thrilled! The coat is gorgeous, and all of the details just add to its stunning beauty. It looks fabulous on you. Congratulations.